World War II veterans will soon receive their much deserved pension left unpaid during the past two administrations. 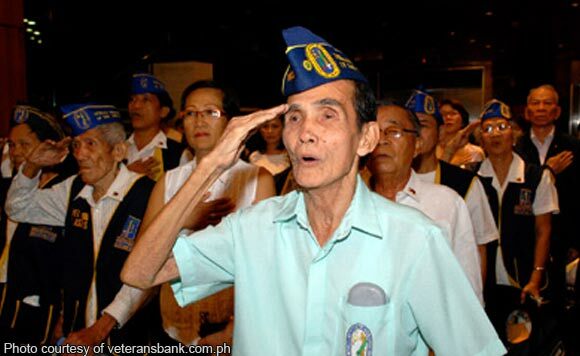 President Rodrigo Duterte ordered the concerned government agencies to immediately release P6.421 billion for the pension of military retirees from 2008 to 2013. The President promised to provide a better life for the war veterans and their families as he paid tribute to the war heroes. “I assure our veterans [and] their families that we are prioritizing your entitlements,” Duterte said. "I am directing the Department of Budget and Management, DBM, and the Department of National Defense to expedite the early release of the AFP’s (Armed Forces of the Philippines) retirees pension credentials for fiscal years 2008 to 2013 in the amount of 6,421,000,000 (pesos)," he said in a speech. "No matter what we do, we can never do enough to repay you,"
"Our surviving veterans have suffered much. They should not suffer more. In the twilight of their years, they deserve a better life. I assure our veterans [and] their families that we are prioritizing your entitlements. We have settled the backlog in disability pensions. We also made the management of almost 200,000 pension accounts more efficient," he said. "I am instructing them today to further improve their services and accessibility. As a legacy to the next generation, we have subsidized the education of more than 2,500 of our veterans’ dependents under the Iskolar ng Bayan program. With education, we hope they can secure a better future," Duterte said. "These entitlements do not compare to the sacrifices that you have made. But we want you to know, our nation [and] our people are grateful to you for what you have done and we will do better," he added. "Take the time to recognize them because what I say is not trite. It is the truth: Without them, we would not be here. Let Araw ng Kagitingan remind us all that Filipinos are capable of tremendous feats of heroism. Let this monument be a beacon for all to be brave in the midst of challenges and uncertainties. Let today be an occasion to reaffirm our vow: we will never waver in our efforts to secure what is best for the greatest common good of our nation," he said. The President then urged the younger generation to recognize the sacrifices of war veterans and treat them with much respect and deep sense of gratitude. “We must never forget that we owe them a deep debt of gratitude. Utang po natin sa kanila ang ating buhay,” he added.